Marína Sviðbalki lives in Greenland around the year 1075. Marietta da Firenze is a lady from Florence, Italy living in Amsterdam around 1375. Mari Clock van Hoorne lives in the Amsterdam area of Netherlands, around the year 1575 during the Dutch Revolt. Sometimes at events you may find Mari working at Troll. She likes being a Troll. 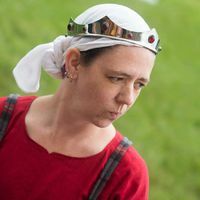 She also enjoys list running if there is a tournament happening, and loves serving feasts. Having a strong love of games, be it card games, board games, or lawn games, Mari has created the "Household" Gameday Taverne. The general purpose of Gameday Taverne is to (hopefully) schedule and arrange Servers for feasts at local events... and of course, play games! These days you can sometimes find Mari helping out in the kitchen because her son Siege seems to enjoy them, and it is important to support the children in their endeavors. Enjoys the more anachronistic parts of the society, to include terms like Autocrat, Feastocrat, and Head Troll. Other favorite anachronisms include wearing comfortable, warm, waterproof boots with a nice, warm wool dress. Has been recognized with various honors, including, but not limited to, Queen Cypher, Artisan to the Crown, Clothier to the Crown, and Awards of Esteem. Images and information on various art projects can be found here. Need to reach me? Send me an Email or reach me through Facebook. If needed for any Court appearances, please contact my partner Jarl Thorson, or any other Shiremate in Caer Adamant, for arrangements. If receiving an award document, a note to the Scribe assigned: Please to do whatever style you are most comfortable with. This page was last edited on 25 April 2019, at 12:30.